The Integral Management-I: An Overview—M.S. Srinivasan. Business and Management practices are going through an evolutionary transition. Captains of business are under a barrel of fire. The recent spate of scams and meltdowns has eroded people’s faith in business and its leaders. Globalization of business has added new complexities and problems, which require a new synthesis. Ethics, values, ecology, quality, customer satisfaction, innovation, balancing the needs of local cultures with global realities are some of the difficult issues facing contemporary business. There is a renewed questioning of existing objectives, scope and contents of management and a search for a greater and more fulfilling synthesis. In the human dimension too an increasing number of people in the corporate world, especially the creative and talented, are seeking for something more than money and career, for an inner fulfilment in the mental, moral and spiritual spheres. This is the context, which creates the need for a new approach to management that can lead to an integral fulfilment of all these trends and needs of the future. This article presents a vision and a path which can lead to such a higher synthesis in management. Let us take some brief snapshots of the evolving corporate world. When we look back at the early seventies, the dominant corporate values are shareholder value, market-share, profit-maximization, productivity, and competitive advantage. Looking again after another ten or fifteen years, you see some new values like quality, customer service, innovation, knowledge-management, and globalization gaining prominence. Presently we see another set of values like social responsibility, sustainability, ethics, and employee development, slowly gaining increasing acceptance among corporate leaders. A new concept, which is popular at present among business leaders, is “triple-bottom line”: economic, social and environmental. What is the meaning and significance of this change or evolution in values? Are the present values the highest possible ideals in management? Or is there something higher? What Next? And a Manager may ask, if there is something higher or a next step, why should I take it? How does it affect my bottom line or effectiveness? We can perhaps get some clues to answer these questions if we examine the corresponding or parallel evolution in terms of conception of human nature and motivation theories in management. According to Stephen Covey, evolution of management thought may be viewed in terms of three paradigms (1). First is the scientific-authoritarian paradigm of Fredrick Taylor, which viewed the human being as a physical man or a “Stomach” seeking mainly for economic survival and security. In this paradigm, the path of motivation is through a system of punishments and rewards administered by an authoritarian management style. The second paradigm is that of the human relations school which conceived human beings as a “heart” with emotional needs for appreciation, recognition and affection. The path of motivation lies in treating people with respect, decency, courtesy and kindness. The third paradigm views the human being as a “mind” with its need for knowledge, self-expression and self-actualization. Here, the motivational strategy is based on providing sufficient autonomy and opportunity for people to develop and express their mental potentials and talents and harness them for realizing organizational goals. This is the paradigm of the human resource development. The first, Taylorian paradigm is predominantly physical, the next human relations paradigm is social, and the third Human Resource Development paradigm is psychological. And finally, Stephen Covey presents his own principle-centred approach as a “spiritual” paradigm. In this fourth paradigm a human being is viewed mainly as a “soul” seeking for “meaning.” According to Covey, the highest motivation happens when people are given the freedom and opportunity to use their talent to serve a meaningful moral cause. Thus, in terms of organizational development the highest conception arrived in modern management thought is the concept of the “triple bottom line.” And in terms of human resource development it is the principle-centred paradigm of Stephen Covey. We are now in a better position to answer the question we have raised earlier. There is a meaning and pattern behind this change and evolution of values and conceptions in business and management thought. Modern business has gone through a process of natural evolution from the physical-economic, social-emotional to the mental-moral paradigm. Integral approach agrees with Stephen Covey that the next step has to be the spiritual paradigm. But in the integral view Covey’s paradigm is not entirely spiritual; it is predominantly mental-moral, but it can be a very effective preparation for the spiritual. This brings us to the meaning of spirituality. In the spiritual paradigm the primary emphasis is on the awakening of the spiritual self in man, which is beyond his body, life and mind. But there are two kinds of spirituality. The first one rejects the life of body and mind and the world for a lonely spiritual salvation. The other embraces the life of body and mind and integrates them around the spiritual self. 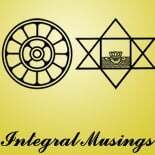 The paradigm of integral management is based on this second type of affirmative spirituality. However the integral view will add an evolutionary dimension to the spiritual vision. Individuals and collectivities are at various levels of development. All may not be ready for the spiritual life. We have to progress towards the idea through various stages. The integral approach will try to understand each human organism as it is in its present condition and help it to take the next higher step in evolution. The first step in this evolutionary journey is to understand the nature of the individual and the collectivity in an integral perspective. In the integral conception, a human organism is a four-fold being with a body, life, mind and soul. Body is the outer most physical dimension of our being. The vital is the source of our sensations, feelings, emotions, desires, passion, and action and the vital energy that animates our body and mind. The mind, in the concept of integral psychology, is made of three parts – rational intelligence which reasons, judges, generates and discriminates ideas and concepts; the pragmatic mind, the source of professional competence and skills, and which works for the practical application of ideas and concepts; the ethical and aesthetic mind sensitive to higher values like truth, beauty, goodness and harmony. And finally the fourth dimension, the soul – beyond body and vital, above the rational mind, and deeper than the ethical and aesthetic mind – is the seat of the higher universal consciousness of the Spirit. However, the primary emphasis of the integral approach is on the psychological and spiritual development of the individual. Psychological development means development of the pragmatic, rational, conceptual, dynamic, emotive, volitional, ethical and aesthetic faculties of the vital and mental being. Spiritual development means awakening the spiritual centre of our being and its higher supra-rational faculties, such as intuition, and makes it the conscious governor of our body, life and mind. Similarly, just like the individual, an organization or the collectivity has a body, life, mind and soul. A collectivity like an organization has a physical dimension made up of material structures like its buildings and machinery; a vital dimension made of its economic, social and political life and its relational power and wealth structures; a mental dimension made up of its information and knowledge structures, decision-making systems and its ideals, values and vision. And finally, every collectivity has a potential spiritual dimension which becomes an active force under the following conditions: first, when the founders of the organization are spiritual personalities with a spiritual consciousness and endow the organization or collectivity with a spiritual purpose; second, when the collectivity awakens to the spiritual dimension in the course of its evolution and its leaders give it a spiritual direction and purpose. This spiritual dimension, when it begins to manifests, will bring three intangible qualities to the organization: first, unity of consciousness beyond or independent of shared goals, values and vision; second, a distinctive psychological atmosphere of peace, harmony and well being; third, a unique and inimitable collective genius. The integral aim of organizational development is thus to integrate the physical and vital life of the organization around its mental and spiritual dimension. In other words, organize the material, economic, social and political life around a progressive mental, moral, aesthetic or spiritual ideal. The central strategic thrust or the Key Result Area in this integral approach will be neither technology nor management techniques such as TQM or six sigma, but a system of education and motivation based on an evolutionary vision of life. This doesn’t mean neglecting or rejecting technology or management techniques, which are essential and indispensable to survive and prosper in the modern corporate world. But in the integral approach, systems and techniques have to subserve the values and ideals of human development. This entry was posted on November 3, 2011 by integralmusings in Integral Management.